Barot is an offbeat travel destination in Himachal Pradesh and most of the travelers who come to this side of Himachal miss Barot. And when they miss Barot, eventually they miss one of the most beautiful and arguably the remotest region of the state, Chota Bhangal as well. Reaching Barot is quite an easy thing. And there is a lot around Barot that you must see. There are seven major villages of Chota Bhangal and out of the seven, four are connected with the road. For the other three, one has to trek into the wild. 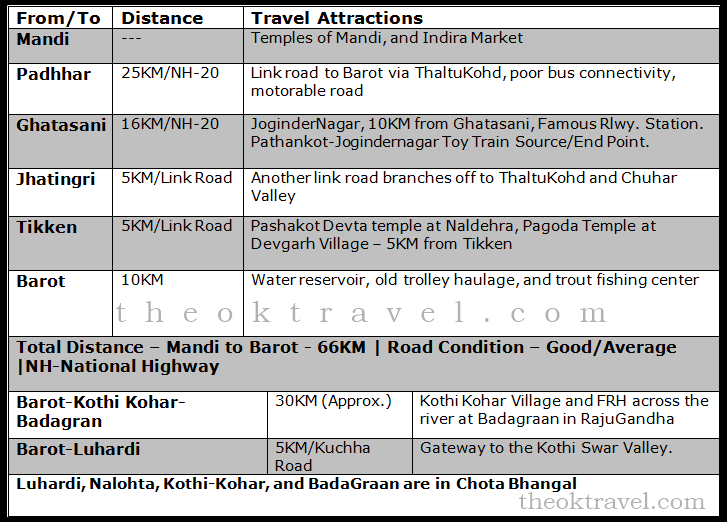 This Travel Guide will help you to make the best of road your trip to Barot and Chota Bhangal. If you are traveling via public transport and coming from Mandi, it is advisable to go JoginderNagar and board the bus to Barot from there. It will only take one extra hour. Buses run from Ghatasni after every half an hour or so. The first bus from Ghatasni to Barot leaves between 7-9 A.M. Timings are not fixed. The same first bus goes until Badagraan so you can get down at BadaGraan, roam around and then come back after an hour or so by the next bus. DO NOT indulge in fishing without taking license from the Trout Center behind the PWD Guest House.